Familles nombreuses! Beaucoup d'espace, cuisine immense !! VEUILLEZ LIRE TOUTES LES INFORMATIONS. Cadre magnifique, à seulement 15 minutes au nord de Port Sanilac, à moins de deux heures de route de la région métropolitaine de Detroit. 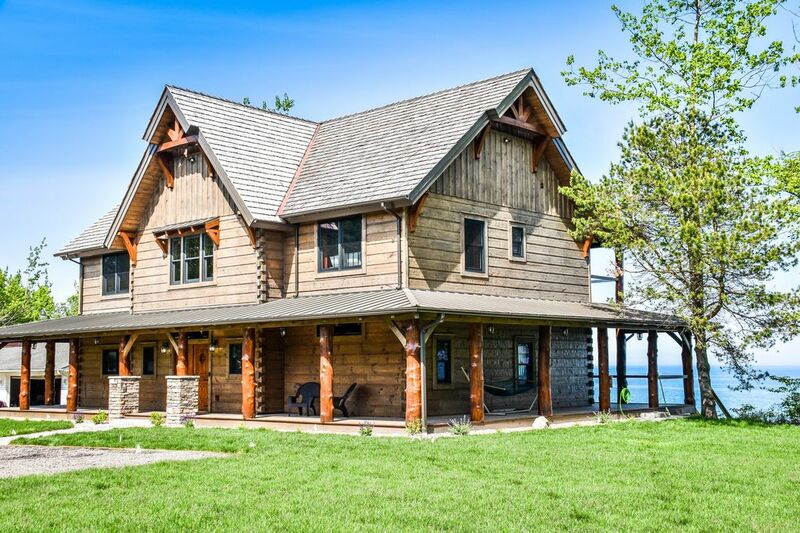 Superbe maison nouvellement construite par les propriétaires de Barna Log homes, Inc.
Cette maison dispose d'un beau plan d'étage ouvert avec beaucoup d'espace pour de grands rassemblements. Cadre calme, situé dans une rue sans issue. * Profitez du bain à remous situé sur le porche en bois arrière surplombant le lac. Le spa est disponible pendant les mois de mai à octobre. Le spa est aménagé pour l’hiver début novembre et est fermé pendant l’hiver. Cela est dû au fait que nous sommes en basse saison. avoir vue sur le lac. Les chambres 2 et 3 partagent une salle de bain "Jack et Jill"
AUCUN MARIAGE OU PARTIS AUTORISÉ. CETTE MAISON EST DANS UN VILLAGE / VILLE ET LA PROPRIÉTÉ NE PEUT ACCUEILLIR CE TYPE DE LIEU. AUCUNE TENTE NE PEUT ÊTRE INSTALLÉE SUR LA PROPRIÉTÉ. Le locataire principal doit être âgé de plus de 25 ans. Nous pouvons envisager une exception à cette politique dans certaines circonstances, alors renseignez-vous. IL N'Y A PAS FUMER À LA MAISON OU SUR LES PORCHES DE LA MAISON. Les fumeurs doivent se débarrasser correctement des mégots de cigarettes. Pêche, Marina, golf, natation, équitation, restaurants locaux, à courte distance de Port Sanilac et Harbour Beach. Stunning home with great attention to detail! This house was put together with breathtaking taste. Every piece of architecture is unique, yet they all flow together. Very spacious! We visited in December, would love to visit in the summer months and watch the freighters go by! This home has it all. Beautiful, large home. Cold, rainy weekend but the home is so cozy and comfortable that it didn't matter. Homeowners are quick to reply with answers to any questions. Perfect for large families. Already looking at the calendar for a repeat vacation. Truly enjoyed this home. This place is amazing! Walking through the doors and seeing the water is breathtaking!! Gina was always prompt with replies. The surrounding towns are friendly, and the drive there is pleasant. But the house. AMAZING! Perfect set up to spend time with friends and family alike. The tall ceilings and floor to ceiling windows/door walls allow you to enjoy Lake Huron 24/7. A stunning place and setting. It'll be hard to sleep without the crashing waves tonight! The house and views are insanely gorgeous! The instructions for clean up and getting into the property we’re easy. We will definitely be staying here again! This property was wonderful. We stayed with some friends and our families. The owners were very responsive and helpful. Lots to do, even on a rainy day. It was easy to get to from the Ann Arbor and Detroit areas. The deck was beautiful and large - we hosted yoga classes there almost every day of our stay. We enjoyed the beach area and large fire pit, as well as use of the kayaks. The owners are right to suggest water shoes. There are some roots from plants that have been cleared to help make the beach more open just a bit out into the water, but if you go over a bit, there are very few rocks, just soft, somewhat mucky sand - shallow out a long way and an easy swim. It was a great space to spend a long weekend getaway!